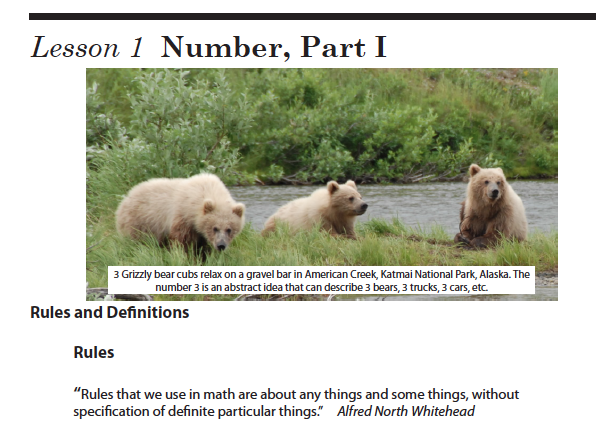 The following is the fifth in a series of posts covering Shormann Mathematics, Algebra 1, the newest product from DIVE Math and Science! Click here to read the complete document that covers Shormann Math core ideas, course description, and Algebra 1 table of contents. After years of teaching mathematics, researching math curricula and math history, and applying mathematics as a scientist and engineer, I concluded mathematics can be taught by covering 10 major concepts. The 10 major concepts are: number, ratio, algebra, geometry, analytical geometry, measurement, trigonometry, calculus, statistics, and computer math. While all 10 concepts can be taught in any K-12 course, specific concepts will be emphasized more or less at appropriate times. For example, number and ratio will be emphasized in younger grades, algebra in Algebra 1 and 2, etc. I know what you are thinking right now, and that is “But CALCULUS is one of the 10 major concepts! How can you possibly teach calculus to an Algebra 1 student? !” Well, if you have even an 8th grade level of math proficiency, you know that if it took you exactly one hour to drive 60 miles, your average speed would be 60 mph. If you understand that, you already understand something about calculus, because calculus is really nothing more than studying rates of change. And yes, it gets more complicated than that example, but it also gets less complicated, too, so much so that there are things about calculus you could teach a kindergartner! Most state mathematics standards do not include calculus, and none that I know of require calculus in high school. And the federal Common Core math standards include no calculus, and almost no precalculus either! However, the discovery of calculus is one of the greatest mathematical achievements ever! All the great technological achievements of the last 300+ years are in some way or another related to calculus! And proficiency in calculus opens the door for a student to choose any college major, while an inability to pass calculus limits a student to about 20% of college majors. For high school mathematics, most home schools and private schools simply parrot whatever their state standards are, which means they complete Algebra 1, 2, and Geometry, and check off math on their transcript, not really knowing why they did math this way. With Shormann Math though, we want you to know why you are doing math differently. We are going to paint a broader brush than most math curricula, teaching math like a language, while at the same time helping you become proficient in standard Algebra 1, 2 and Geometry concepts. Along the way, rather than avoiding calculus because you heard it was scary, you are gently introduced to it. And, before you know it, you will be understanding more calculus than all your peers, and probably even your parents, ever did! Rather than an afterthought or a scary thought, Shormann Math makes calculus a normal, natural part of the curriculum, and culminates with a formal (and yes, it’s optional!) calculus course that will prepare students to receive college credit via CLEP or AP Calculus. Done in a thoughtful and age-appropriate way, all 10 major concepts listed above can most definitely be represented in one way or another in a K-12 mathematics curriculum. This entry was posted on August 26, 2014 at 7:15 am and is filed under Teaching Mathematics. You can subscribe via RSS 2.0 feed to this post's comments. We read through the linked doc. above and Shormann Math looks absolutely outstanding! We have used Saxon Math for the past 12 years at every level & would never have thought we would jump ship…we will and can’t wait to do so! Thanks so much for all your hard work.. Don’t grow weary of doing good! You are a tremendous blessing and are being used in so many ways; each glorifying our Creator. Thank you for your encouraging words, and for taking the time to write, I really appreciate it! Rest assured, logic is already woven into Shormann Mathematics. It is such a foundational part of mathematics that I didn’t list it as a place where math is used. In my opinion, logic is more of a foundation than an application. In Shormann Mathematics, students will learn about inductive and deductive reasoning, conditional statements, syllogisms,the connections between ratio and rational, logic and logos, etc., and that’s just in the first quarter of Algebra 1! By the time students finish Algebra 2, they will be familiar with all the logic topics presented on the CLEP College Mathematics exam, and then some.